If your Leak Detection Test (Section 1) indicated a continuous leak, consider using the Isolation Method to discover the leak location. This is often the quickest way to locate ongoing, hard-to-find leaks. This guide assumes one leak for ease of demonstration; however, you may have more than one continuous leak. Do not use water or operate any water-using devices in or around your home during the test. You will first check the service line, then isolate systems or watering-using devices as appropriate and finally, you may need to do visual inspections. 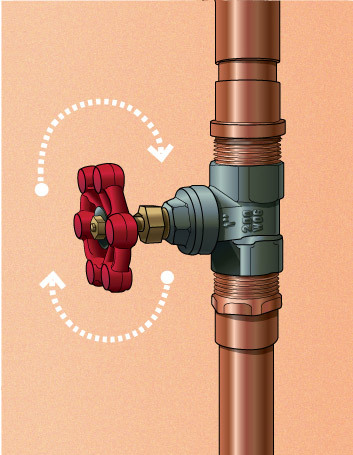 A gate valve opens by turning the handle left (counter clockwise) to start water flow and closes by turning it right (clockwise) to stop water flow. 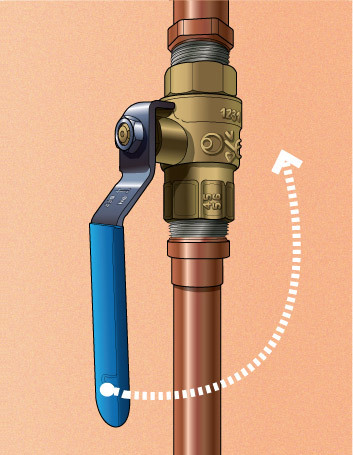 A ball valve opens by turning the handle parallel to the water line to start water flow and closes by turning it perpendicular to the water line to stop water flow. CAUTION! Shut-off valves may fail or break if they are old or corroded. You should only turn shut-off valves by hand. Note: You will be turning water supply valves "on" and "off" in this section. You may prefer to utilize the services of a professional plumber or contractor rather than doing the work yourself. 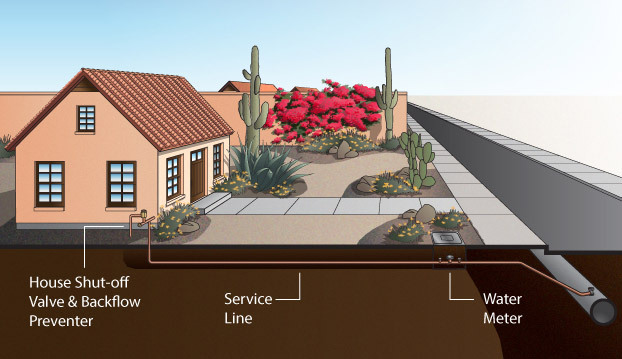 The service line is an underground pipe that carries water from your water meter to your home. These steps will prevent water from flowing to all other areas of your property while keeping your service line full of water and pressurized. To check the service line: Do not turn off the water supply at the water meter. The service line must remain full of water and pressurized during leak checks. The service line will continually refill with water if a leak is present. Look at your plumbing setup. 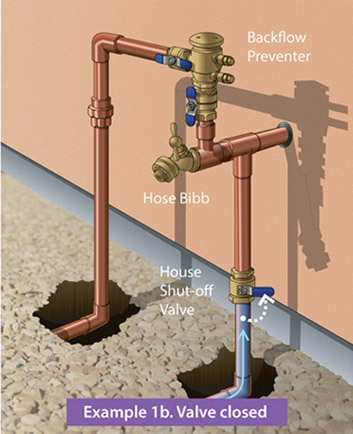 Do you see any water supply lines that bypass the house shut-off valve? (See Example 2b.) If so, turn the shut-off valve to the "off" position as well. Note: a small amount of water may "squirt" from the backflow prevention device when you turn "off" the valve. Turn on a house faucet. Water flow should stop. Run your irrigation controller. You should not have water flow to the landscape. 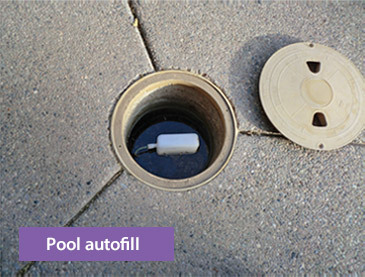 Press or push the autofill as if to trigger water flow into the pool. No water flow should occur. Use your water meter to perform a Leak Detection Test (Section 1). If the water meter is still recording water use, call a plumber for repairs. If the water meter did not record water use, your service line is not leaking. Turn the shut-off valve(s) back to the "on" position. It is the homeowner's responsibility to find and repair leaks on the homeowner's side of the meter box. If you need the water supply shut off at the water meter, contact your water provider for instructions. These steps will isolate the irrigation system by preventing water from flowing through it. 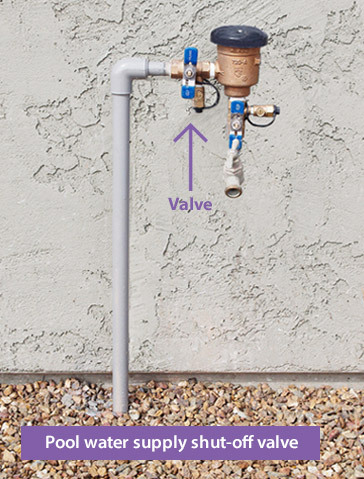 Find the irrigation water supply shut-off valve generally located adjacent to the backflow prevention device on the front, side or back of the house. Turn it to the "off" position. This will isolate the irrigation system from its water supply and stop a leak, if present. Run your irrigation controller. Water should not flow to the landscape. If your water meter is no longer recording water use, you have discovered a leak in your irrigation system. The leak location is most likely in the pipe between the backflow preventer and an irrigation valve box or is a malfunctioning valve inside an irrigation valve box. If your water meter is still recording water use, your leak is elsewhere on your property. You may leave irrigation water supply shut-off valve in the "off" position until all isolation tests are complete. These steps will isolate the pool system by preventing water from flowing through it. Find the pool water supply shut-off valve generally located adjacent to the backflow prevention device on the side of the house closest to the pool. Turn it to the "off" position. This will isolate the pool system from its water supply and stop a leak, if present. If your water meter is no longer recording water use, you have discovered a leak in your pool system. If this is the case, turn off the water supply and fill the pool with the hose as needed until a repair occurs. Turn the shut-off valve back to the "on" position or you may leave it in the "off" position until all isolation tests are complete. See Section 2, Swimming Pools and Spas, for more pool checks. Some irrigation and pool systems do not have dedicated shut-off valves. If this is the case, you may be able to use the backflow prevention device to isolate the irrigation and/or pool systems. As with the irrigation system and pool, you can isolate all water-using devices that have a water supply shut-off or bypass valve. Items of special note are reverse osmosis (RO) systems, clothes washers, humidifiers, icemakers, water heaters, evaporative coolers, water features and water softeners. Each time you stop water from flowing to a water-using device, perform a Leak Detection Test (Section 1). If your water meter no longer records water use, you have discovered a leak. You may leave the water supply shut-off valves in the "off" position until all isolation tests are complete. Go outside your house and check all water supply pipes outside your home. Supply pipes are full of water and pressurized, often hidden from view and can leak continually. 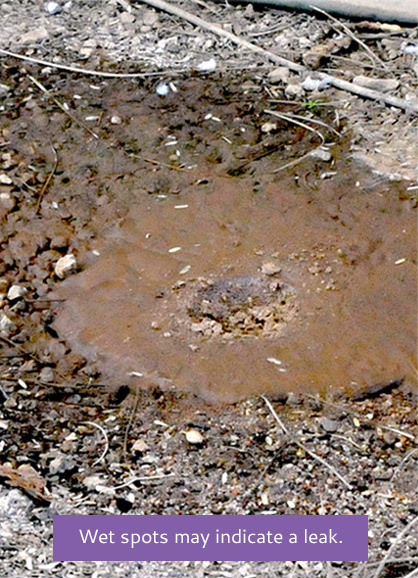 Look for wet spots, small holes and depressions in your yard, as they may indicate an underground water leak. Inspect your property along the water supply routes from the house shut-off to your pool autofill water supply shut-off valve. 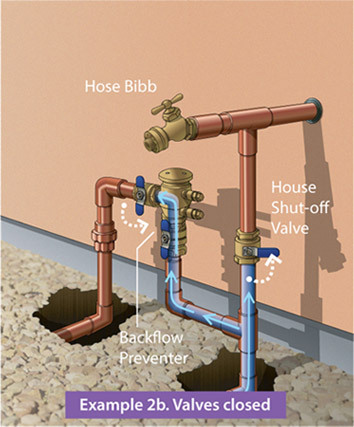 Inspect your property from the house shut-off valve to the irrigation water supply shut-off valve. Go inside your house and look for damp spots and water stains on the ceiling and walls. Check for "hot spots" on the floor after running hot water to nearby fixtures as this could indicate a leaking hot water pipe under the concrete slab. Most interior pipe leaks occur on hot water supply lines due to expansion/contraction from temperature changes. You may need to use the services of a professional plumber or contractor who provides leak detection services if you cannot discover the leak location.